The opposition has been rightly criticized for failing to offer a coherent, attractive vision of a future after Chavez. It’s important to start this debate now, putting forward a positive, optimistic vision of what Venezuela could achieve if it had a genuinely forward-looking, genuinely inclusive government. Any post-Chavez government will face a seriously daunting set of institutional, economic, and fiscal and social policy problems. Part of the reason I came back to grad school is that I was tired of participating in a public debate where everyone is obsessed with politics but nobody seems to have the slightest concern with policy. But it’s policies that solve problems, not politics. Coming up with credible, inclusive development-oriented policies will not be easy, but it can be done. This, it seems to me, will be the biggest challenge facing the next government. Venezuela’s public institutions are so frayed at this point that only a program of root-and-branch reform can redeem them. First, an analogy. In the first world, you can picture leaders as operators at a sophisticated industrial plant. They sit up in their control room surrounded by flashing lights, buttons, and levers – the machinery of the state. That machines give them information about how the plant is operating, they analyze that information, evaluate it, and then make decisions about what series of buttons they’ll push and what series of levers they’ll pull to get the plant to do what they want. In time, they will receive feedback from the plant, analyze it again, and push buttons anew. First world people rarely even stop to think about how it is that the decisions taken in the control room become actual policy on the ground – everyone just takes it for granted that the system works. Now, shift to Venezuela. We also have our leaders sitting up there in their Miraflores control room, and superficially it looks like what they’re doing is not so different from what leaders in the rich countries are doing. They’re getting information, making decisions, pressing buttons, pulling levers. But look closer and you’ll realize the plant they’re running is so old, misdesigned, clunky, and under-maintained, that the information it gives them is gibberish, and half the buttons aren’t connected up. You pull a lever and chances are the thing comes off in your hand. Long ago, somebody stole the wires connecting the lever to the parts of the plant it’s supposed to control. And the plant itself is so rusty and neglected that even if the control-room worked, the machinery at the other end is just unable to do what it’s supposed to. If you want anything done at the plant, you have to get out of the control room, find the one guy on the factory floor who knows how a part of the machine works, slip him Bs.50,000 and ask him to go do it by hand. Now, part of the problem with Chavez is that he hasn’t the slightest clue what the various flashing lights are supposed to mean or what the various levers are supposed to do. He’s just not very good at all this formal decision-making jazz, he has no knack at all for pushing buttons and pulling levers. In fact, he’s broken more than a few that still more or less worked when he got to power, like the FIEM button and the Conatel lever. For the most part, though, the machines were broken when he got there. Chavez has dealt with the problem mostly by just going around the broken-down machinery – by using the army to distribute social welfare instead of the civilian Social Development bureaucracy, or his party to put on the various Misiones. I can certainly understand his frustration with the dysfunctional machinery of the state, but just bypassing the existing institutions doesn’t strike me as a very promising solution in the longer term. Instead of fixing the institutions we had, the government seems to have given up on them altogether. Now, what does this mean for the post-Chavez era? First things first: thinking that you can fix the problem simply by putting someone more competent in the control room is silly. What Venezuela needs, is a small army of engineers, electricians and repairman willing to go through systematically and fix not just the machines, but also the linkages between that control room and the machines. They need to replace the burnt out wires, mend any number of components that stopped working a long long time ago, and get the plant to something like proper running order. This is going to be slowwww, laborious, unglamorous, boring work – not nearly as glamorous as running a revolution. The Venezuelan state is huge – over 1 million employees – and famously resistant to change. Some of the institutions – like the Social Security Institute – are so screwed up they’ll probably have to be scrapped and replaced. Many others will need to be rebuilt from the ground up. We’re talking the Consumer Protection Agency, we’re talking the Judicial Police and the National Statistics Institute and the tax collection agency, and the Cinemateca Nacional and the entire Education Ministry. I could bore you to tears listing the completely screwed up state institutions in Venezuela badly in need of reform…the list is long. Very long. These reforms are important because having a proper bureaucracy is the key to ending some of the most damaging features of both the pre-Chavez and the Chavez era: corruption and cronyism. When the formal machinery of the state doesn’t work, your access to the state’s services, contracts and payroll is predicated mostly on who you know on that shop floor. This sets up an insider/outsider dynamic, where people with privileged access gain and everyone else is excluded. Now, Venezuelans hate this. They hated it so much, they voted for Chavez on his promise to end it. The sad thing is that instead of fixing the problem, the government has just substituted the old-AD cronies with its own. Quitate tu pa poneme yo. To my mind, if democracy means anything, it means equal protection under the law. The whole point of a rational bureaucracy is that it treats everyone the same. It may not be particularly nice treatment, but it’s equitable. Think Weber here. When you go to get a driver’s license at a DMV in the US, for instance, you find yourself in a line of people all being treated in the same way – people whose abstract equality is honored by the bureaucratic sameness doled out to them. In fact, this routinized sameness is such an unremarkable feature of first world bureaucracies, people in the first world don’t stop to think about it very often. Like so many of the institutions Venezuela needs and lacks, a routinized, rational bureaucracy is something Americans and Europeans just take for granted. But what happens when I go to get my driver’s license in Caracas? Well, I have two options – I can either wait in line for N hours with everyone else, be given contradictory information and made to wait who knows how long for the actual license, or I can just pay off one of the inspectors and get VIP treatment, cafecito, fast-track paperwork, even the answers to the test, for God’s sake. Everyone is equal, but people with money or connections are way more equal than everyone else. So the breakdown in the machinery of the state not only breeds corruption, it also makes a mockery of the constitutional principle that all citizens are equal and should be treated equally by the state. And if the DMV example seems somewhat glib, scroll down and read Death at Dawn to see what happens when institutional breakdown and the blithe disregard for the rule of law seeps into the law enforcement system. The decoupling of the police from the formal legal system is one of the most alarming instances of institutional breakdown over the last five years. Rebuilding those linkages, reconnecting those levers and buttons, is a really pressing task. Institutional reform is about inclusion, real inclusion. It’s about building a society where everyone actually does have an equal claim on the state’s protection and resources by virtue of citizenship rather than connections or ability to pay. Institutional reform is about making sure that when Rusleidy calls on the state for protection, she gets the same level of attention as a well-connected chavista would. In fact, if I had to prioritize the list of institutions in need of intensive reform, I’d put the police, the prosecution service, the courts and the prisons at the very top of the list. But overhauling the state is also important for economic and social reasons. Institutional reform is a pre-requisite to successful implementation of any kind of serious development policy. The state we have now is so bloated and hapless, it can’t possibly serve as an competent manager for a long-term process of sustainable and sustained development. You need modern, forward looking public institutions that can bridge the divide between different groups in society, you need leadership that systematically seeks to include all stakeholders when it comes time to design policies, and that works to build agreements between those stakeholders. Development can’t happen without good governance. Now, institutional reform will not be easy in Venezuela. The habits of mind associated with corruption and cronyism have deep roots. You’re not going to get rid of them overnight. But you’re just not going to have a proper democratic society until you have functioning institutions. Since I refuse to accept that Venezuela will never be a proper democratic society, I’m forced to believe that institutional reform will be difficult but not impossible. The Venezuelan economy is hurtin’. Bad. By some accounts, over half the manufacturing firms in the country went out of business over the last 5 years. The survivors are, more often than not, in very bad financial shape. An exception is the banks, and companies that moved aggressively to protect their assets off-shore in 1999-2002. On the whole, though, the economy has lost substantial capacity. Badly needed capital has simply been destroyed, or fled the country. Without the built-in safety net of oil revenue, the country would undoubtedly already be facing hyperinflation. The combined effects of a fantastically hapless government and a sporadically self-destructive opposition have depressed living standards substantially. So the first thing any new government must do is re-establish confidence in its ability to run the economy competently. That alone would provide much needed stimulus, and allow the return of a good portion of the capital that fled from 1996 to 2002, as well as attracting new capital from abroad. Establishing a reputation for stability and a track record of real positive interest rates for savers would, over time, raise the level of domestic spending, lowering the country’s dependence on foreign capital. This much a post-Chavez government could achieve relatively quickly, just by appointing well-qualified people to key positions and asking them to make some soothing, pro-market noises. Unfortunately, reaching macroeconomic stability is only the first in a long series of policies needed to launch a country into sustained and sustainable development. On this issue I agree partially with the critics of neoliberal globalization: it’s foolish to think that just liberalizing markets and looking after macroeconomic equilibria will bring growth and development. The government does have to establish a reputation for sound economic management, but it can’t stop there. It has to do a lot more than that. Now, that’s not a call to return to the discredited policies of the 60s and 70s. The era of big government is over. But it is a call to eschew the kind of market fundamentalism people like Joe Stiglitz have built a career out of criticizing. It’s important to think outside the box on this one. Ideological rigidity can really harm efforts to make sensible economic policy. The slogans of the right, where less state involvement is always better, are just as untenable as the slogans of the left, where more state intervention is always better. Governments need to be canny about their policy interventions, moving aggressively to promote policies that will make a difference without losing sight of the market mechanism’s unique ability to allocate resources efficiently. In November 2001, the Chavez government forced them to travel farther from the coastline to fish in order to preserve the fish stocks nearer to the coast, which are important to local small-scale “artesanal” fishermen. The policy was actually a good one, environmentally and socially, but it has been difficult to implement because of the ill-will of the large-scale fishermen, who were cut out of the decision-making process. Now, how would a serious, development minded government have handled a problem like this? The key is to sit down at a table where ALL the stakeholders represented – including both the large and the small scale fishermen, but also the people who process the fish, the people who make and repair the boats, the transport companies that take the fish to market, the coastal neighbors, along with policy makers, environmental experts and marine biologists who understand the population dynamics of the fish species involved. When you make an effort to include stakeholders, you make it much more likely you’ll find a consensus that benefits everyone in the sector, or that at least tries to be sensitive to the needs of everyone involved. The government’s role is to first be an honest broker, and then to implement decisions that give no one everything they asked for but gives everyone part of what they asked for. In this pluralist-bargaining model of public policy-making, people from many different points of view come together to try to solve common problems creatively and cooperatively. Perhaps what the commercial fishermen need are new trawlers that travel further using less fuel, allowing them to fish further out at sea without going out of business. Maybe the government can help finance that investment through preferential loans, or investment tax credits. Perhaps what the artesanal fishers need is a bit of technical advice on how to start coastal fish-farms, using cages to breed many more fish than they could catch in the open, and increasing everyone’s income. Or maybe the commercial and the artesanal fishermen can brainstorm the problem and come up with a fantastic, creative solution no outside expert could have thought of. In the pluralist model, the state becomes a forum where the various elements of civil society can come together to work out solutions to specific problems. Pluralist bargaining is all about pragmatism, about collective problem resolving, about results. Of course, many of you are probably thinking this is a pipe-dream. But I don’t think it’s so crazy to hope that we could get there one day. Certainly, as a model of how the state should operate, one could find much worse. And this kind of approach has worked wonders in many countries, yielding policies that stakeholders feel especially committed to because they took part in their design and implementation. The pluralist state doesn’t bark orders at its constituents. It helps constituents design rules that make sense to them for solving the problems they’re having. But on top of macroeconomic stability and a state that works hard to craft pragmatic, consensus policies to address specific economic problems, there’s a third element I think will be crucial to launching Venezuela on a path to self-sustained growth: science and technology – or more specifically, science and technology policy. Probably this is a matter of “desviacion profesional” because, well, it is my field of study. But actually, there’s very good reason to believe that the intersection of science, engineering and business is the place where economic growth, real economic growth, actually happens. If Venezuela is to integrate into a liberalized world economy in a way that raises living standards in the long run, the only viable way to do so is by substantially upgrading the private sector’s scientific and technological capacity. Why? Because in the current world economy, the division between traditional industries and knowledge-intensive industries is quickly vanishing. As international markets integrate and competition intensifies, firms many traditionally “low tech” industries are forced to invest in science and technology just to survive. Take fish farming, which I know entirely too much about after writing a research paper about it last week for school. Not so long ago, fish farming involved nothing more than stocking a natural pond with fish and feeding them with agricultural refuse like rice-bran. In Europe these days, however, fish farming has become a science-based export industry that relies on an increasingly sophisticated understanding of fish biology, nutrition, reproductive cycles, genetics, and fish epidemiology. You need a Ph.D. in wave dynamics to design the ponds at some of the more sophisticated european fish farms these days. This is not a simple industry. Of course, if you go to Bangladesh, you’ll also find a huge fish-farming sector. However, those fish farms are nothing like the ones in Europe. The traditional, low-tech fish farms in Bangladesh can only compete with the European operations by paying very low wages to their workers – which is viable enough in Bangladesh. Now, in some senses, the amazing thing is not that the Bangladeshis can actually compete with the Europeans. What’s really amazing is that the Europeans – with their vastly higher salaries – can compete with the Bangladeshis. The reason is straightforward enough: Each European worker is orders of magnitude more productive than each Bangladeshi worker. The Europeans compete almost entirely on the basis of their technical dexterity – which overwhelms the Bangladeshi’s wage advantage. With their access to plenty of capital capital and scientific know-how, the high tech European fish farms can remain economically viable without having to scrimp on wages. So how can a country like Bangladesh hope to stay in a market like this, facing the scientific might of Europe? Basically, they have two choices: they can lean on their wage-advantages harder and harder and keep underselling their rivals by exploiting their workers harder and harder, or they can increase the productivity of each worker so they can afford to pay more without compromising their profitability. It’s pretty obvious to me what the more socially desired economic strategy would be. What is true for Bangladeshi fish farmers is true for leather apparel makers in Mérida, for automotive parts makers in Valencia and precision engineering firms in Caracas and cheese makers in Lara. Ultimately, the only hope the poor countries have of escaping the poverty trap is to make a conscious effort to upgrade their scientific and engineering capabilities – and not just in “high tech sectors,” but throughout the economy. A progressive technology policy geared at deepening and broadening the knowledge intensity of the entire economy is crucial to achieving this. Universities and public research institutes need to design research portfolios specifically intended to develop areas of knowledge of relevance to local firms. R&D grants and tax credits, public funding for research institutes, and efforts to make specialist knowledge available to economic agents throughout the economy should allow Venezuela to embark on the development path that other successful late developing economies have followed. Cases like South Korea, Chile, Singapore, Ireland and Taiwan demonstrate amply that it really is possible to make the transition from mass poverty to mass-middle class comfort in a single generation. In each of those, governments first established their macroeconomic bona fides, then instituted inclusive models of economic policy-making that stress the importance of public-private partnership, and then pushed their local firms relentlessly up the technical ladder – giving them incentives to constantly invest in developing ever more sophisticated products using ever more knowledge-intensive production methods, and pushing them ever closer to the international technological frontier. In time, these policies produced firms able to compete and win in liberalized global markets. It’s a model well-worth emulating. Now, it’s obviously a matter of some concern that four of the five countries I’ve just listed were dictatorships at the time of their economic miracles. It seems to be true that democratic governments usually have a harder time implementing the kinds of proposals I’ve been describing than enlightened-autocracies. But it’s not impossible to combine the two. The experience of Ireland proves that you don’t need an autocratic government to implement a serious development agenda. Some would argue that Ireland was only able to achieve such spectacular growth because of the direct transfers it has receive from the European Union. But in many ways, Venezuela’s oil wealth is not that different, macroeconomically, from Ireland’s structural transfers from Brussels. In both cases, it’s money that appeared in government coffers more or less out of thin air. The point, obviously, is not how much money the government has access to (if that was the case, Venezuela would be Switzerland!) – the point is how smart you are when the time comes to make policy. In academic circles in Europe, at least, there’s a growing sense that the policy mix I’ve been describing could serve as a new model for sustainable and sustained development. Sometimes called the Aalborg Consensus (after the university in Denmark where it was first formulated) the policy mix is an extension and re-interpretation of the standard neoliberal model, rather than a wholesale rejection of it. The hope is that the Aalborg recipe of macroeconomic stability, inclusive stakeholder-centered policy making, and a strategic tech policy could become the backbone of a progressive, theoretically rigorous, pragmatic and viable alternative to the Washington Consensus. The model was developed by Swedish and Danish researchers seeking to theorize the success of their own economies. As a Scandinavian-inspired model, the stress is on cooperation and technical dexterity, together with political legitimacy and inclusiveness. It has been argued that the Aalborg Consensus fits the historical experience of the late-industrializers in Asia with uncanny precision. In an era of increasing disenchantment with the market fundamentalism of the neoliberal model, the Aalborg Consensus offers both a theory of why neoliberalism has not worked (because it ignores the technical base) and a prescription for how to combine trade liberalization with meaningful economic development. My belief is that in the next few years we’ll see the Aalborg Consensus emerging as the alternative to neoliberal globalization. But that’s also my hope. I mean, I don’t know about you, but I would much rather embark on a development strategy patterned on what happens in Denmark than one patterned on what happens in the US. It might seem like an odd choice to pair up for analysis, but in fact fiscal and social policies are two sides of the same coin. Public services are financed out of the public purse, so looking after the solvency of the public finances is not a bad idea if you intend to institute a serious, long term social policy plan. Because social policy is expensive business. The state is years behind on its social commitments, on its commitment to build enough schools, houses, and courthouses. The state is years behind in terms of instituting all kinds of social services, and a good part of this is down to the fact that the Venezuelan state is, more often than not, broke. There are really two problems here: the state is too small a part of the economy, and the economy itself is too small. On the one hand, state revenue for 2004 is projected to total about 16 of GDP in the budget – including almost 8% of GDP in oil income. Aside from this “free money” coming from the oil industry, the Venezuelan state only captures 8.4% of the economy as tax revenue. Compare that to the situation in most of the first world, where public sectors generally tax and spend at least 25% of GDP, and more like 35-45% in Europe. Those are, of course, much richer countries – but they also have substantially larger public sectors. That’s what it takes to finance the large welfare states their electorates demand. So the challenge is twofold. First, the next government needs a credible strategy to grow the economy substantially over 20 or 30 years. But at the same time they expand the economy, they also need to expand the public sector’s share of that economy. The alternative is to squabble over a shrinking pool of resources. Venezuela’s experience over the last 6 years powerfully illustrates this. Even though the government has made a huge effort to raise spending from 24.8% of GDP to 28.4% of GDP from 1999 to 2002, real public spending barely budged. The overall contraction of the economy overwhelmed their efforts to expand public spending. 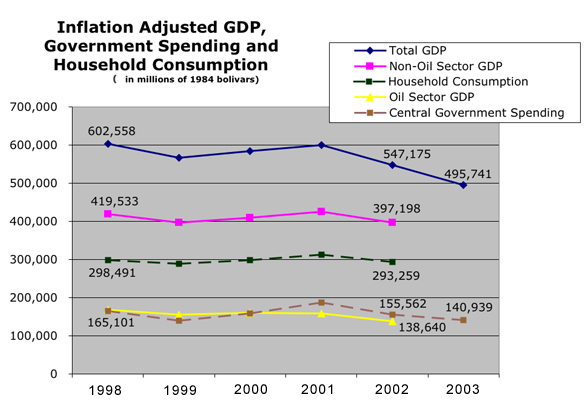 After adjusting for inflation, public spending is a bit lower now than it was in 1998. That’s without taking into account population growth. Sources: Finance Ministry and Central Bank. Not all data are available for 2003 yet. And that’s to say nothing of the huge burden of domestic debt the government has taken on over these five years. With the government trying to milk more and more money out of a smaller and smaller economy, pressure grows to turn to short-sighted, damaging methods of financing. Stunts like the “millardito” pick the pockets of the most economically vulnerable by feeding inflationary pressures and crowding out the private sector. The upshot is that private household consumption is pinched – and the pinch falls hardest on the lowest income people, who are least able to afford price rises. Those are the rules of the negative sum game that is Chavez-era Venezuela. The government has great social sensibility, but left to squabble over a rapidly shrinking cake, its thirst for cash to spend comes to the detriment of the rest of society. The question is how to go from this lose-lose situation to a positive-sum game, one where a growing economy and a reformed and strengthened state can start delivering quality social services for the first time. It doesn’t have to be this way. If the country can find a path to strong and sustained economic growth, the government would be able to capture larger and larger shares of national income without having to pick the pockets of Venezuelans via the inflation tax. In just six years, public spending could double in real terms, growing from its current 20-something share of GDP to 40% of GDP at the same time as household consumption and gross fixed capital formation (investment) grow substantially. The figures are a lot more meaningful in per-capita, constant dollar terms. Sources for 1998-2003: Finance Ministry and Central Bank. 2004-2010 are my projections. This is not to suggests that the Venezuelan state will be cash flush by 2010, even in the best of scenarios. Paying for all of the nation’s public schools, hospitals, armed forces, bureaucrats, pensions, unemployment benefits, cultural activities, sports, housing, training, research and development, cops, judges, court houses, prosecutors, roads, ports, bridges, firefighters, social workers and more out of just $1,930 per person per year is still a stretch. But you go a hell of a lot farther with $1,930 than you do with $880. Similarly, trying to get by on $2,560 per person is not easy for any family – but it’s a hell of a lot easier than getting by on $1,660. It takes thinking in these terms to take stock of the real scale of the problems facing Venezuela, and to set out serious, inclusive plans for a post-Chavez future that’s worth striving for. About half of Venezuelas live in what’s sometimes euphemistically called “self-built housing.” Many people in Venezuela’s barrios lack access to the basics of urban living like garbage collection, police protection, sanitation, transport, electricity and access to cooking fuel. Moreover many shanties are built on dangerous sites, like the unstable hillsides around Caracas that sporadically give way to mudslides. Being forced to live in such dangerous places is one of the bitterest inequalities poor Venezuelans endure today. A team of architects and urban planners linked to UCV, Alemo, has studied the problem carefully to try to determine the minimum public investment necessary to upgrade all shantytowns, nationwide, to minimum acceptable standards of crowding, health, safety, and access to urban services as well as to build enough decent new low-income housing to keep up with population growth. They conclude a project like that would cost $60 billion over the next 10 years. Now, how realistic is that? Today, that’s about a third of all public revenue – way more than the country can afford. But what would happen if the state could get into a position by 2010 where it has $50 billion to play with each year. Well, then a figure like the one Alemo suggests becomes far more feasable. $6 billion would still be a large outlay, but it could imaginably be accommodated. As matters stand now, though, with a government that has less than $25 billion to spend each year, investments on that order of magnitude are just not feasible. The government might attempt some specific urban regeneration projects in a few areas, but it simply can’t finance an infrastructure project on the scale needed to meet Venezuela’s massive urban housing problem. Instead, the government finds itself picking winners and losers again. At present, ministers boast of building 40,000 new homes a year – though, like most government figures, this one is impossible to audit or confirm. The problem is that that figure covers just a third of the new housing needed to meet the growth of population. Venezuela has a young population, and 120,000 houses a year are needed just to stay even. So for every family that got its hands on a government-built house last year, two others were forced to either build themselves homes – often in dangerous areas with no basic services – or to stay in unacceptably crowded housing with relatives. The government extends basic social provision only to a (relatively) privileged few instead of putting in place a serious program to help all citizens in need equally. These problems are all connected. The reasons the government can’t put together a decent housing policy are the same reasons it can’t make decent policy in general. The state is broken down and broke. No one part of the system can’t change unless all the others change. And the whole system can’t change unless each part of it changes. A competent, stakeholder-centered, tech-savvy state that helps foster economic growth is needed to spur rapid economic growth. Rapid economic growth is necessary to finance a state strong enough to finance solutions to the very serious social problems the country faces. If you actually care about the living conditions of the poor you have every reason to advocate fast economic growth. Growth is very well documented to be the best remedy for poverty out there, not only due to the jobs it generates, but also because it gets the government the money it needs to make effective social policy. It doesn’t do poor people any good for the government to be really really concerned about them if it’s is too broke to help them. What’s true of the housing crisis is true of every other social problem. If crime is out of control right now, this is at least partially due to the fact that the government simply can’t afford to hire enough cops, prosecutors, judges, public defenders, prison guards and court clerks. If the poorest 25% of Venezuelans go to school for an average of just 4 years, that’s at least partially because the state can’t afford to hire enough teachers and build enough schools. If there’s no gauze in the hospitals, that has more than a little bit to do with the fact that the state is broke. Every problem Venezuela has is made worse by the public sector’s never-ending money crunch. Once the state has the resources it needs, the organizational culture it needs, the technical dexterity it needs and the understanding of itself as a consensus-builder it needs, then it can start to implement serious policies for development. Building that state will not be easy or quick, but I think it’s worth a try.